Udupi, 13 Aug 2018: ‘Human beings are extraordinary creations. One should understand self before trying to know others. Every moments of our life enriches our experiences. The positivity is known in one’s personality. If one keeps busy during student life, inner knowledge gets accumulated that is real wealth of experience, said Professor Sri Ram Marate, lecturer of Nitte Engineering College HRD master trainer. 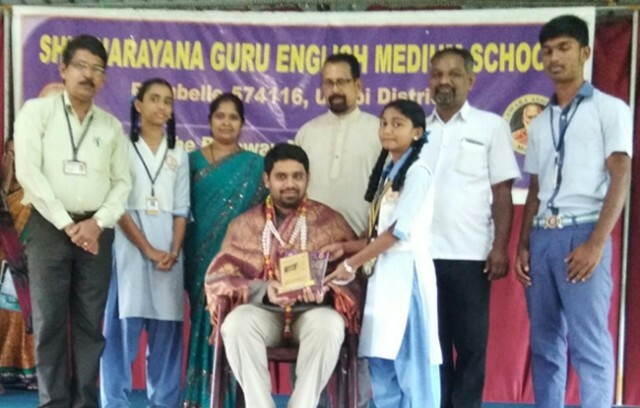 Prof Marate was speaking during valedictory ceremony of 3-day HRD empowerment training workshop that was held at Narayana Guru English Medium School for Class X students, Padubelle, near here, on Saturday, August 11. It was jointly organized by Rotary Club – Shirva and Interact Club. He said, ‘If one has clear goal, discipline and hard work; ordinary folks can become extraordinary,’ said Prof Sri Ram. The teacher Laxmisha felicitated Prof Sri Ram on the same occasion. Interact president Pratvi presided the programme. Rotary Club – Shirva president Dendoor Dayanand Shetty was the chief guest. The School administrator Jinaraj C Salian, SPL Sandeep and others were present.